guys- I just supplied and installed a couple thousand sf of #2 common white oak flooring in 5" widths. We have seen flooring where the open knots are filled with what I presume is epoxy that has been tinted to black and this gives a real pretty look. My question is bondo or epoxy? In my experience bondo dries very hard as does epoxy but there have been times when I don't feel the epoxy dries as hard as I would like and can get a little 'gummy' when sanded so I am just curious to get some other opinions. If I go the epoxy route I would most likely use the West System or a bar top epoxy. In general, I would not recommend the use of Bondo. It dries to a hard inflexible lump that will separate from the wood as it moves. Here is a Idea, don't install flooring with holes in it. Installing floors with holes is unprofessional. Bondo, filler, really? I charge extra for holes as they are a real pain to fill. I used epoxy tinted black. Also used micro balloons to stiffen the epoxy mix so it wouldn't run out the bottom. More than a hundred dollars per gallon for the epoxy and hardener so not an inexpensive fix. When they want reclaimed we have to fill with epoxy. This is a mockup of a commercial tread and riser. That Rangate looks like hot melt! Getting Bondo black enough would be a task in itself. Pretty sure you can tint Durhams Rock Hard Putty. That would be the cheapest material, not sure how big your knots are. You could also drill out the knots and glue in walnut dowels. Bondo is okay for filling dings or screw holes in paint grade cabinets. We have used west system epoxy with graphite powder to fill in similar holes to your pic. If you give epoxy 3 days to cure it will be rock hard and will not clog sand paper. A two part epoxy is easy to mix. I use wood flour to mix with the epoxy so it looks like it matches the floor. 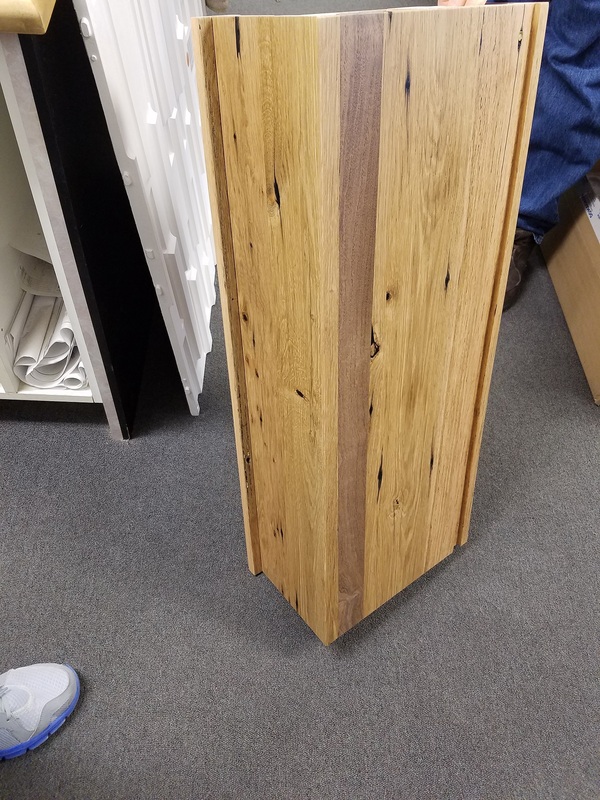 It will be a little darker than the natural colored wood around it.It usually takes 7 hours to harden depending on temperature, but it really sticks. No black holes unless you color it with black resin color. Edger dust makes good wood flour.Three to one epoxy may be harder to mix with the right proportions so it will not get gummy during sanding. We fill at the end of the day so it can harden overnight. We build dining tables and furniture out of reclaimed wood. We've used tinted epoxy for years. Just switched to ran gates knot filler. Won't be going back to epoxy unless it's for larger voids where a structural bond is required. The knot filler is much faster and has far less waste. If you plan to do a lot order extra heat sinks. Thanks guys for your input. I'm thinking I'll give the Rangate product a try.